1. Open the MS Excel application. Launch the MS Excel application, and open a new worksheet. 2. Work on the header. On the header of your document, write the information about your business to certify that you are legally operating a business and to provide details about your company to your recipient as well as your potential customers. The details to be included are as usually as follows: business name, company logo, address or location, and contact information, such as phone number, website, or email address. 3. Do not forget the title or document name. 4. Set the column headings. The style of the quotation varies from one company to another depending on the items they are selling or the nature of the business. However, typically, a quotation consists of the following column headings: item name, short product description, price list, quantity, and net amount. 5. List down the items and their brief descriptions. On the first column, enumerate the items requested by the buyer. Make sure that you did not miss any items and you only include the specific items requested by the buyer. On the product description column, you can include the unit or model number, color, weight, and packaging details. 6. Input the price, quantity, and net amount. Input in the price list and quantity columns the respective prices and quantity of the items listed. Finally, in the last column, you can set the formula that computes for the net amount of each item on the list. You can do this by multiplying the cells under the price list column by the cells on the same row under the quantity column. Copy the formula and paste it to the cells under the net amount header. 7. Compute for the total amount. On the net amount column below the last item, compute for the total amount by simply inputting the formula “=SUM()” then write the range of the cells you want to sum up inside the parentheses. Include the traditional charges, if there are any, or any deductions or discounts. Lastly, finalize and proofread everything before saving your document on your local computer. A lot of events, especially parties, require DJs in order to give life to the events, such as weddings, birthdays, club parties, and school prom. 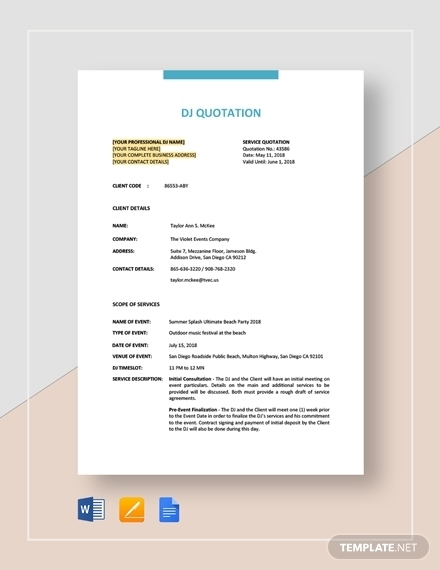 In order to provide a detailed list to your clients, provide them the details of your DJ rates through this DJ quotation template. Created by the finest graphic artists, this template is suitable for your gardening service businesses. 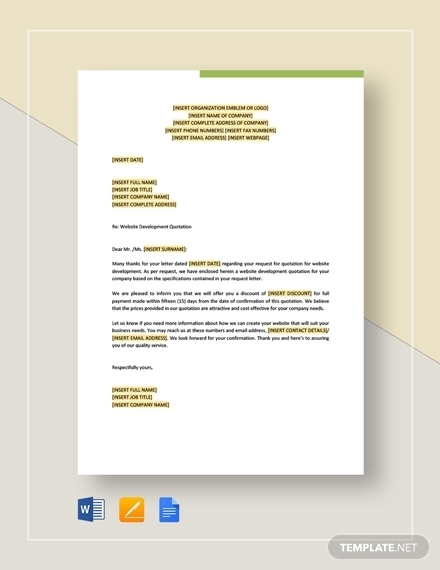 You can edit this template and input the tasks that you will be providing to your clients. 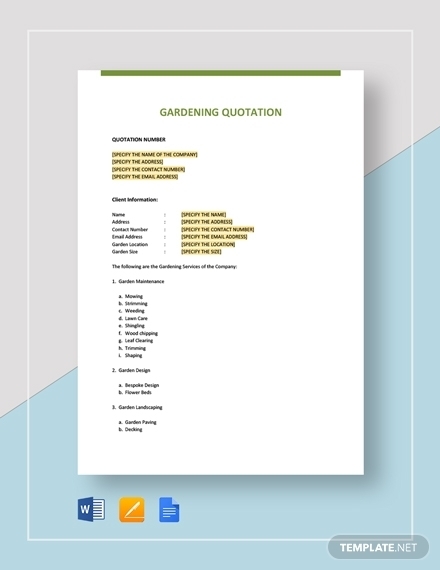 Incorporate any other important information in your gardening quotation, such as your rate per hour and other charges and discounts. 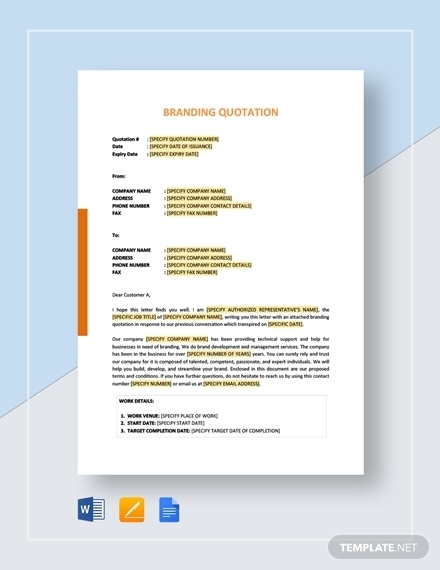 This quotation template is incredibly useful for those entities who are offering company branding services. This will ensure that you communicate the price of your services clearly to your clients. Since you are providing branding services, make sure that you are also designing your document well by incorporating the branding elements of your company. Apart from the carpenter’s tools, a professional carpenter needs to have a proper tool to conduct his trade—a carpenter quotation. This is useful in informing his or her clients about how much the carpentry services are going to cost them. 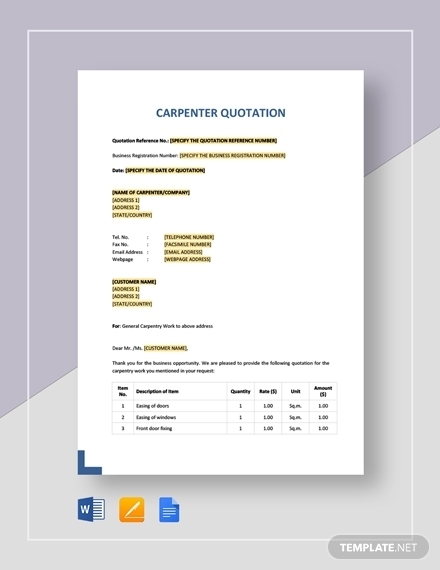 Create a well-designed quotation using this carpenter quotation document. Be straightforward in providing your clients the rates for your video production services. 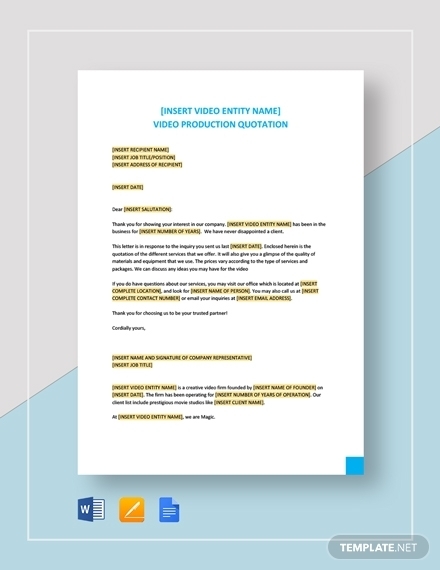 In this video production template, it comes with a list of service options, such as concept, scripting, makeup artists, and voice-over talents, but you can easily customize it to tailor-fit to any customer. 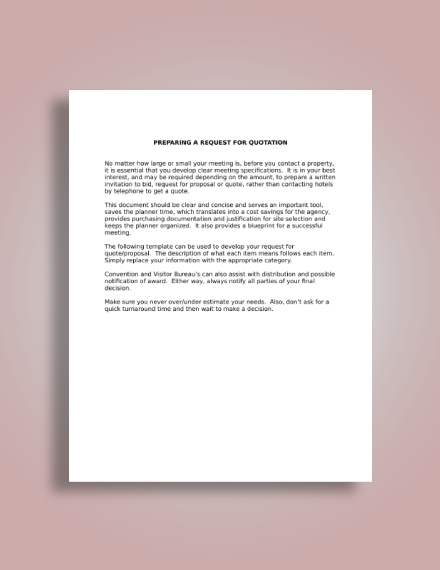 Since a real estate industry can be a lucrative business to get involved in, those who are real estate agents and alike definitely need this real estate quotation template. 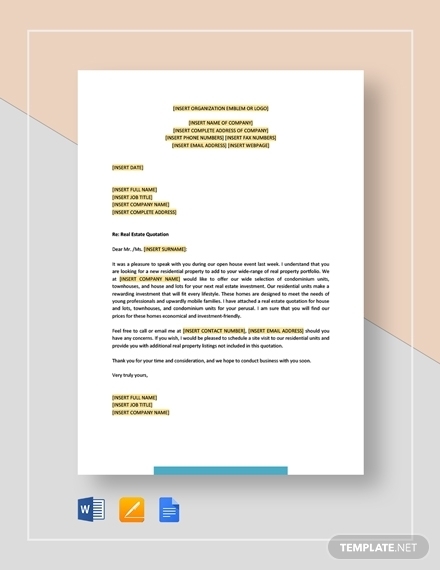 You can edit this template to add your own personal branding and touch to the document. In this professionally designed website development quotation, web designers can immediately have an access to the template right after download. This is very convenient to use since it can be easily customized and edited according to your specific preferences. This is available in different file formats, such as Google Docs, MS Word, and Pages. 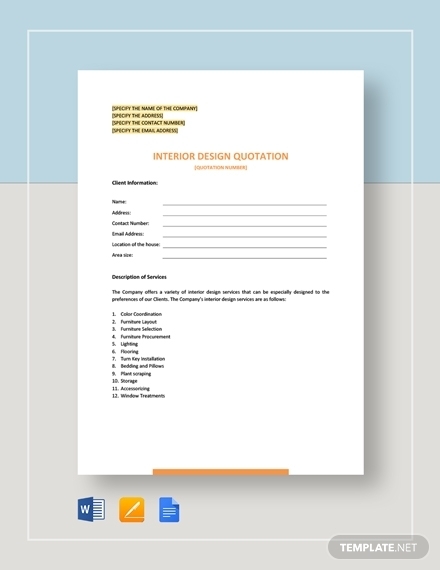 Interior designers need to present their list of services available as well as their respective rates to their clients through the use of this high-quality and beautifully designed interior design quotation. Do not include your personal branding elements such as your service logo design and the colors your company used primary for promotions. In this request for quotation for International Consultancy in Myanmar, the following items are the ones that need to be quoted: daily rate, flights, other travel, and travel insurance. Other terms and conditions are also presented, including the manner of submission, requirements, and information to bidders. 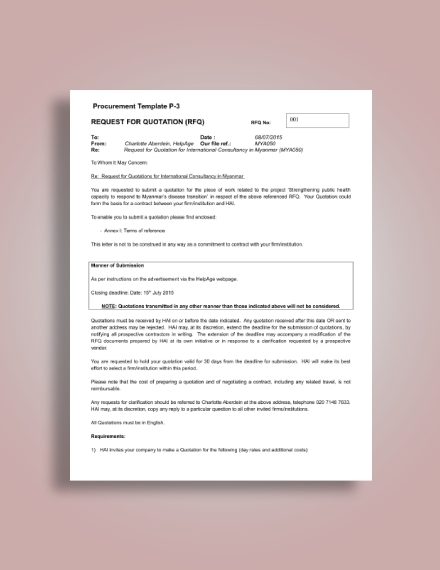 This is a written invitation to bid, request for proposal, or quote a property, specifically a hotel and meeting facilities. The information presented should be clear and concise, and the bidder must provide the details regarding the event profile, attendee profile, dates, arrival or departure pattern, anticipated sleeping room needs, reservation, among others.